THE Ayrshire-based full service creative marketing agency Paligap Brands announces the relaunch of the Golf South Ayrshire website. Paligap has handled the Golf South Ayrshire account since 1999, and after rebranding the entity from South Ayrshire Golf, the agency launched its first website in 2000. This site stayed fairly similar over the next eight years, but due to the mass influx of tourism anticipated in 2009 due to the Homecoming, it was decided that that the site should be revamped and relaunched. 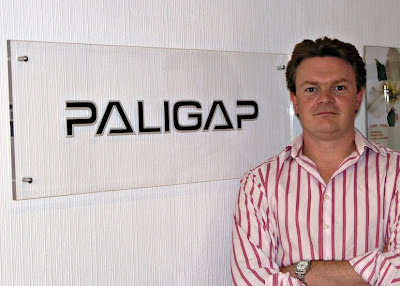 Paligap Brands managing director Stephen Cosh (pictured above) said: “This time it had to be big, look great, be easy to use and allow South Ayrshire Council staff to update portions of the content. It also had to cover all the courses in South Ayrshire, not just the municipal ones. “The site went live last week after a two week build period, and it is one we are very proud of. There are currently 449 Ayrshire business stories permanently archived on this site. To locate those of most interest to you, please use the site search facility in the top left hand corner of this page. Type your search term in the white box, then click “SEARCH BLOG”.